All the colors of the sherbet rainbow are included in this juice from Okami. 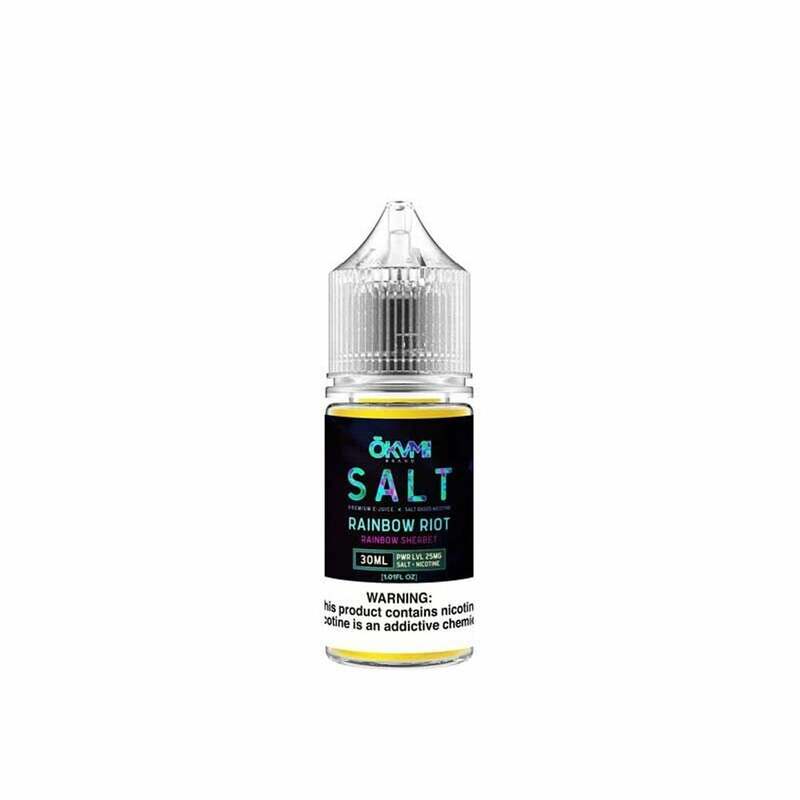 Enjoy the taste of juicy citrus and tart raspberries in this Rainbow Riot nic salt formulation that is sure to give you smooth and satisfying throat hits. Okami nic salts are available in 50mg (5.0% nicotine) and 25mg (2.5% nicotine), are made for use with your favorite pod mod. This is a really tough one to review. I wish there was a way to review without giving stars at all, but I don't think that's an option here. Here's why it's tough to review: it tastes exactly like it says it does, and I hate it. It absolutely nails the rainbow sherbet flavor. I just can't stand it. And that's the problem: do I review it based on what it's trying to do, or based on how much I like it? It's very sharp, and tart. It has a similar flavor to Sweet Tart candy, but very intense. Not pleasant, especially coming from my previous salt, which was a mellow Strawberry/Cream mixture. I put it in my vaporizer before I left the house for the day, thinking I'd get used to it, and by the time I got home, I was desperate to change it out for a different flavor. It actually made me cough when I took more than 2-3 puffs in a minute, which a flavor has never done before. So, that's my review. If you like tart candies (like sweet tarts), or if you're looking for Rainbow Sherbet flavor, this is as close as you'll ever find. It just really wasn't for me. If the manufacturers see this (which I doubt they will), I think it'd really be served well by the addition of another flavor to mellow out the profile. Maybe I'll buy flavors of my own and give it a shot.